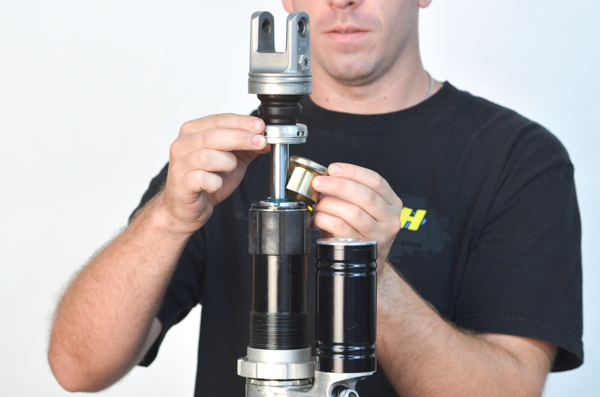 WP Progressive Damping System (PDS) shocks are found on many KTM and Husabergs since 1999. 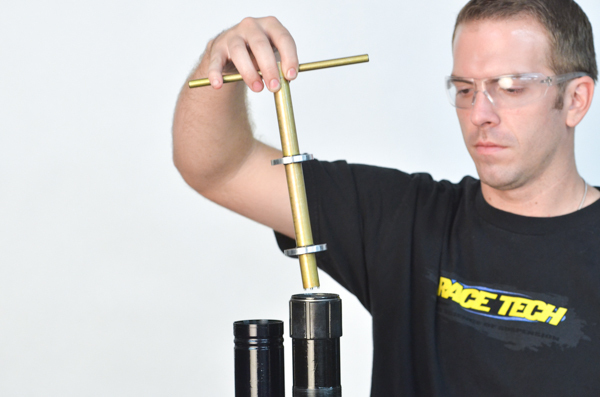 They are designed so that the damping increases as the shock compresses. 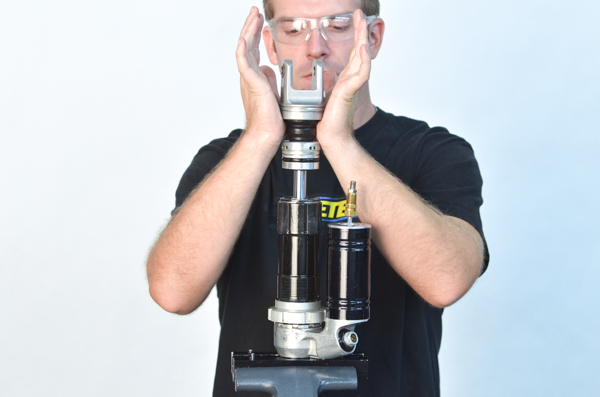 To accomplish this they have a second valving piston and a metering needle. 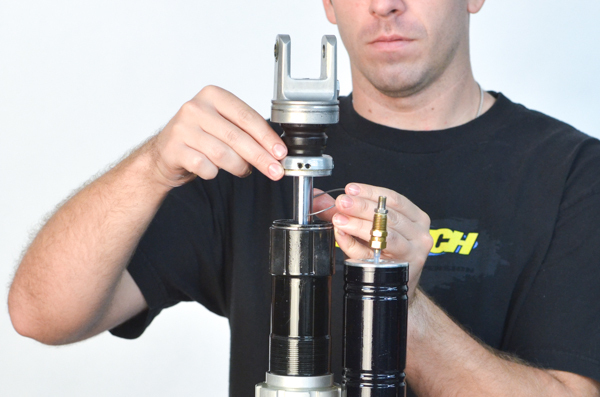 General servicing procedures are the same as other piston reservoir shocks. 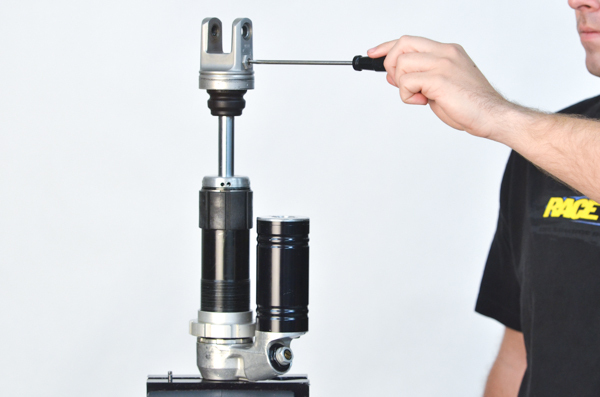 There are instructions for installing a Telescopic Needle (SWCN Series) as well. These shocks come with Piston Style Reservoirs. 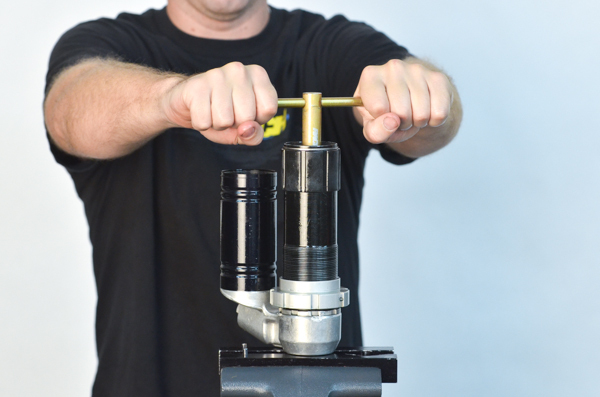 RT offers Bladder Conversions (SWBL Series) for most models. 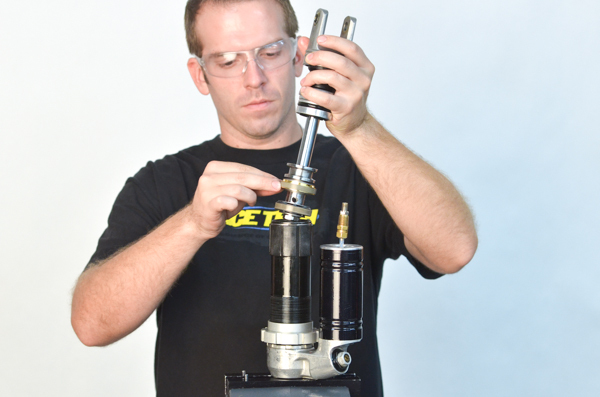 Valving Stacks - Consult the instruction sheet that comes with the Gold Valve Kits for specific procedures. 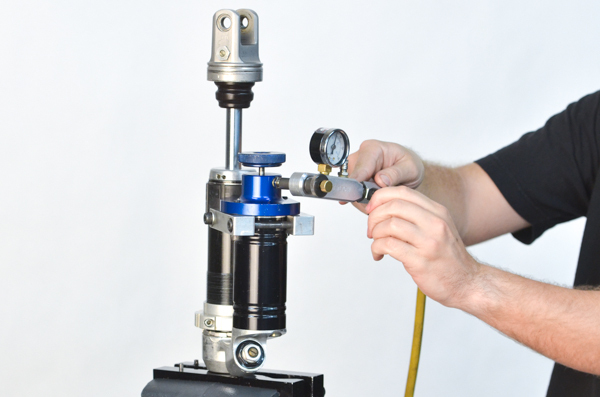 See your DVS Setup Sheet for valving and setup recommendations. 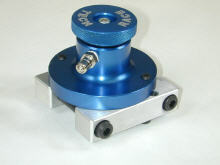 D1 - Place the end of the shock body in a vise, preferably using Aluminum Vice Jaws (TMVJ 065). Check the clicker positions and note the settings. 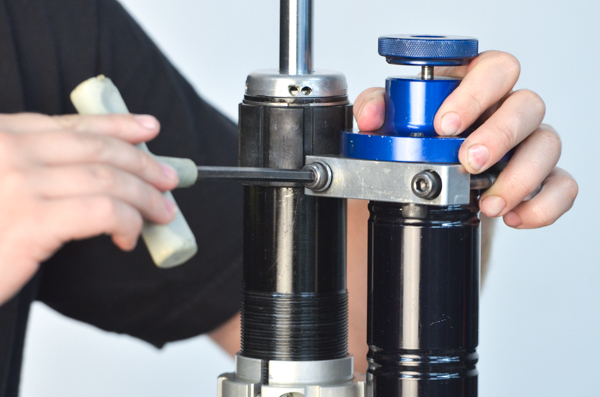 Back the rebound adjusters out all the way before you continue. 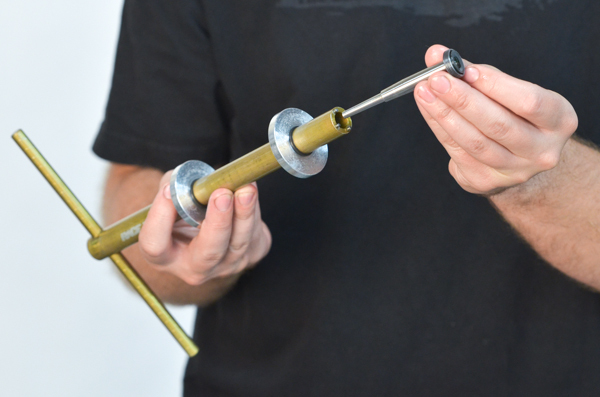 Remove the spring first - not shown but similar to most Bladder Shocks. 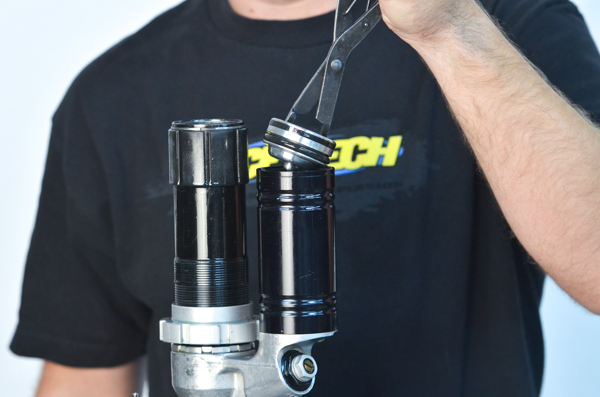 D2 - Back out the compression adjusters all the way. 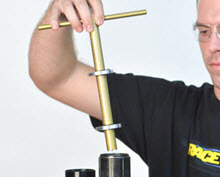 D3 - Release the nitrogen pressure from the reservoir by unscrewing the Allen Bolt. 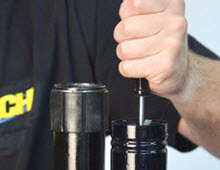 D4 - Remove the shock body cap with a sharp wood chisel. It is a press fit style cap. 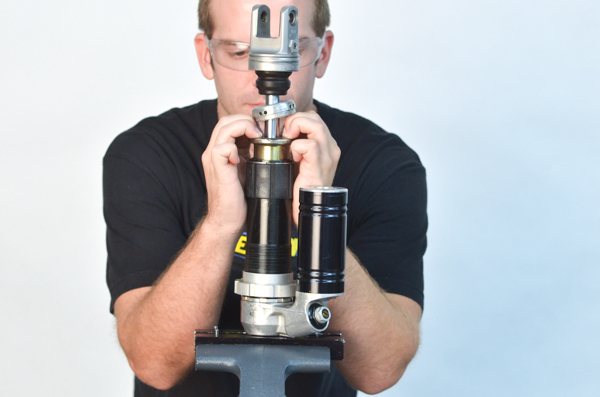 D5 - Insert the proper Shock Seal Head Setting Tool (TSSS Series) around the shock shaft, onto the seal head. 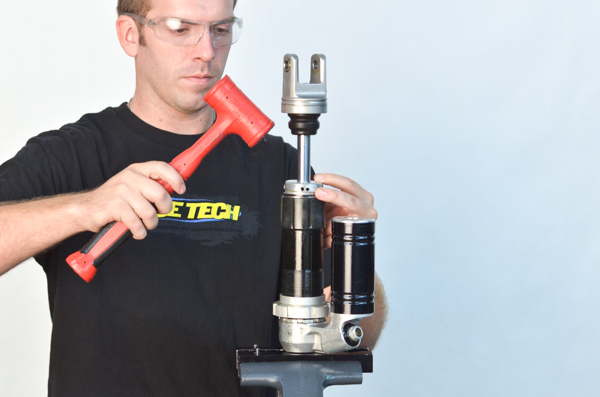 This tool is not required but makes things a lot easier. 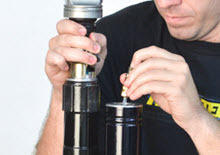 Alternately you can push down on the seal head with your fingers or, my least favorite method, you can push down with a large flat blade screwdriver. D6 - Compress the seal head enough to expose the circlip. 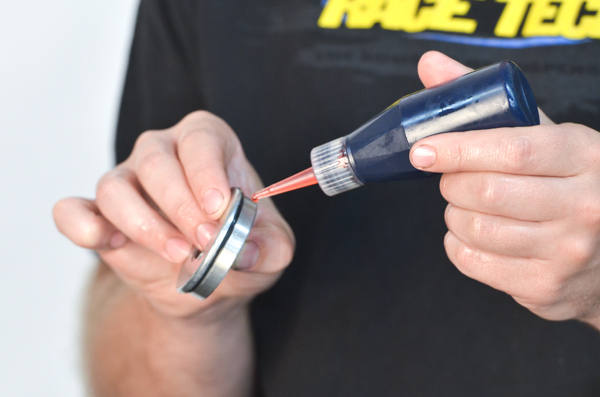 D7 - Remove the circlip with a TSCP 01 Clip Tool or a small screwdriver. 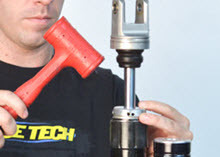 D8 - Remove the shaft assembly from the shock body by tapping with a plastic mallet. 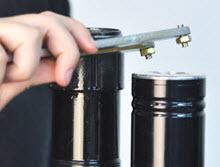 D9 - Unscrew the reservoir cap using a Pin Spanner (TMPS Series). 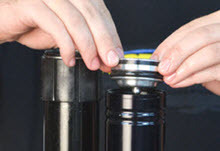 D10 - Remove the reservoir cap. 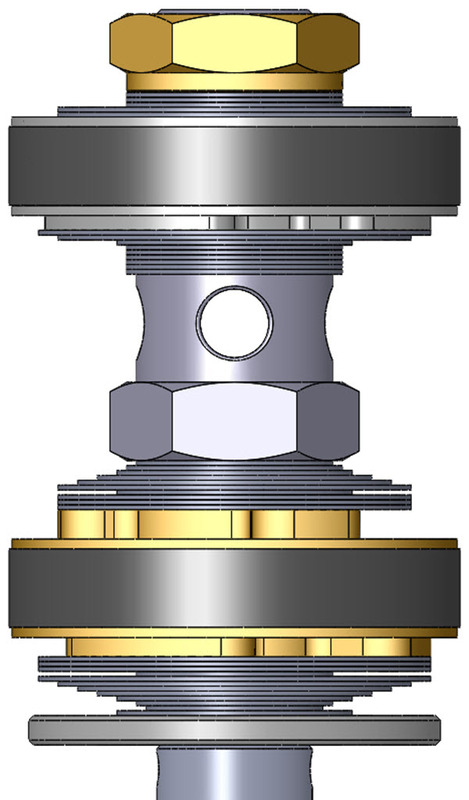 On later models the cap is built into the reservoir body. These are special pliers that expand when you squeeze them. 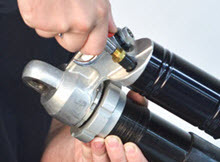 D12 - Method 2: Remove the reservoir piston with compressed air through the bleed port. 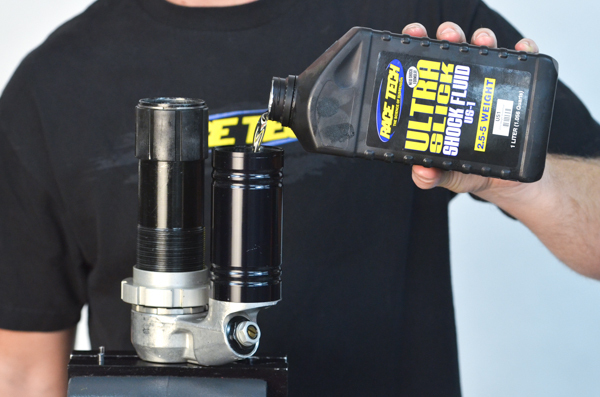 Cover the end with a rag to catch the piston. 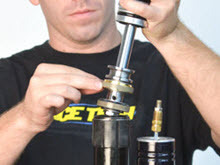 Method 3: Alternately you can push down on the piston with a blunt rod (a #3 Phillips Screwdrver works) through the bleed port. 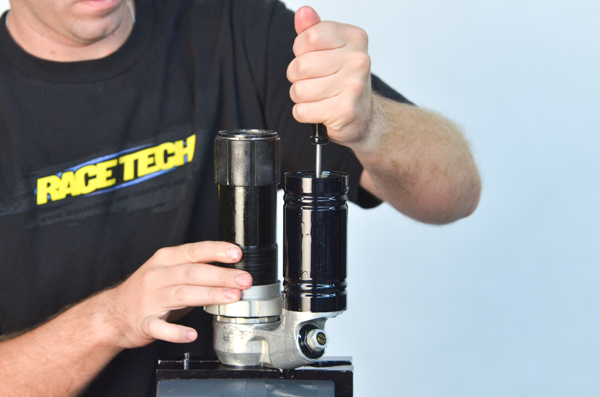 D13 - Drain the oil from the nitrogen reservoir and shock body. 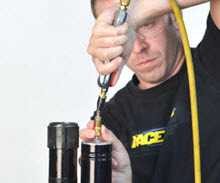 TN1 - If changing the needle to an RT Telescopic Needle, use the proper TSST Series Pin Spanner. There are 3 sizes available. 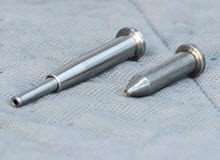 TN2 - This is the RT Telescopic Needle (left) and the stock needle (right). 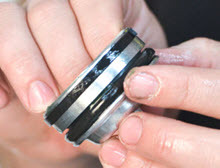 Use a small amount of Grease on the bellville (cupped) washer to hold it in place during installation. 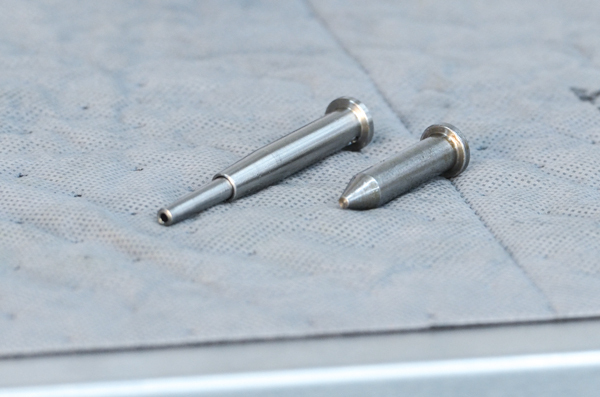 TN4 - Insert the needle assembly into the tool. 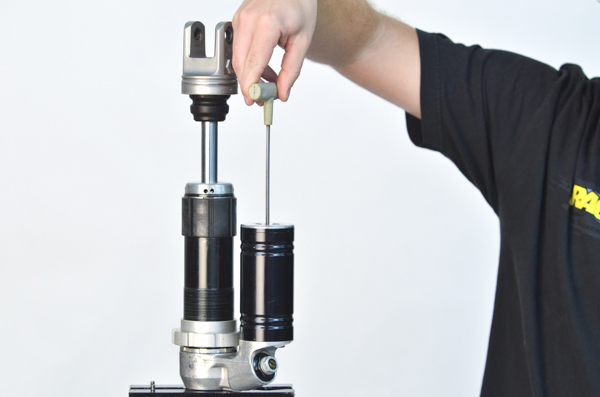 TN5 - Insert the tool with the needle assembly into the shock. 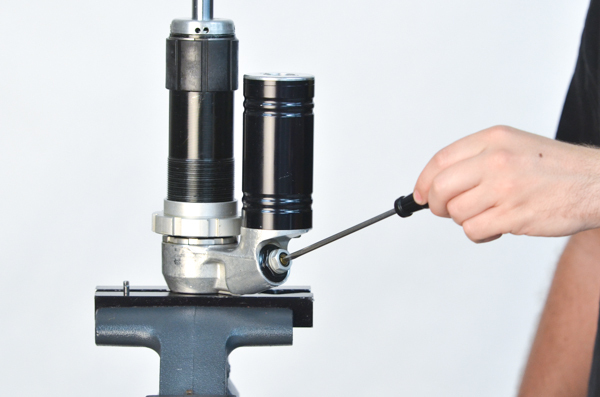 Tighten the needle assembly down to specification. 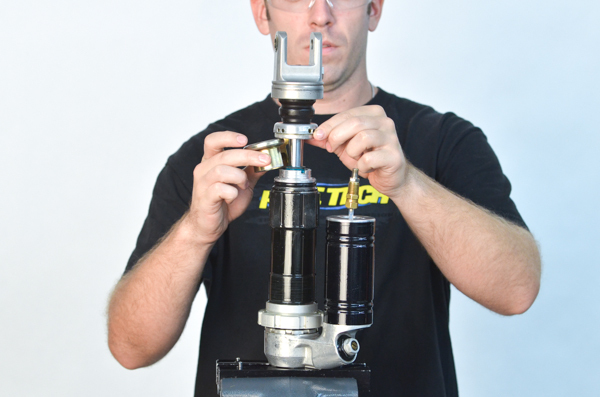 This is best done holding the shock inverted vertically so the bellville washer stays in place. This looks really hard to do but once you get the hang of it... no problem. 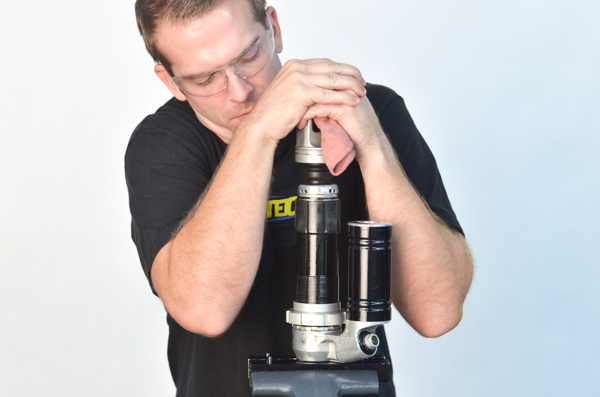 TN6 - Tighten the telescopic needle. 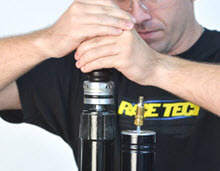 A1 - If you are reusing the stock reservoir piston. 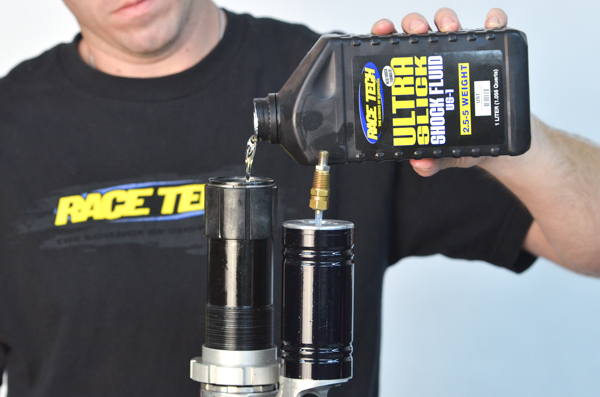 Grease the groove of the piston and install the band onto the reservoir piston. 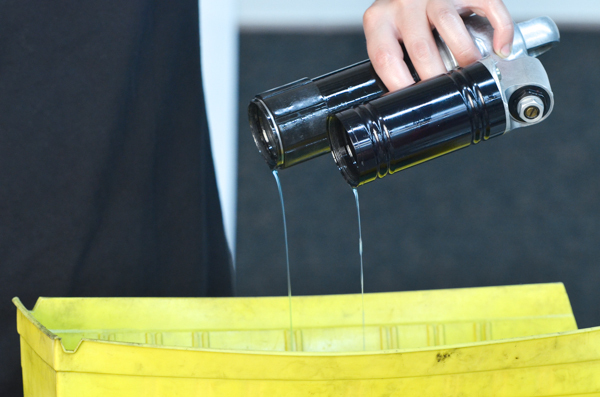 A2 - Fill the reservoir with oil. 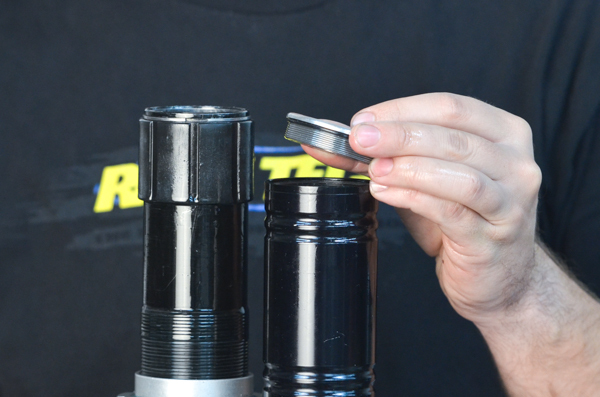 A3 - Push the piston down until the band engages the reservoir. The oil should be overflowing at this point. 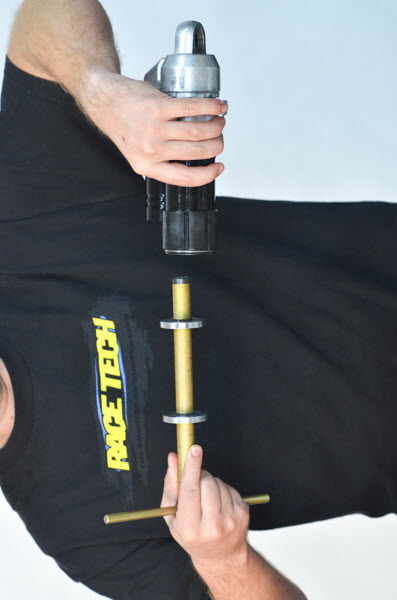 A4 - Invert the shock so any trapped air will be pushed out of the reservoir (not shown). Be sure to catch the fresh oil. 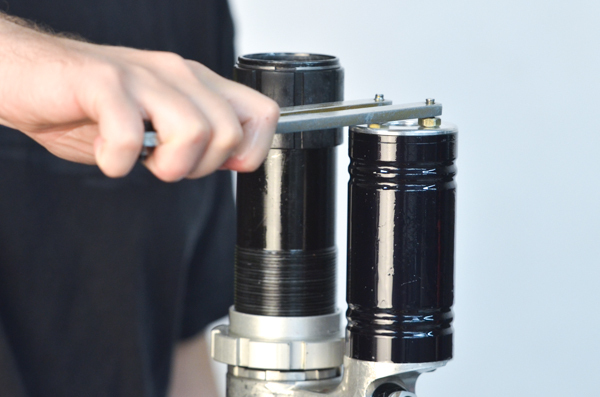 Bleed all of the air from the reservoir by pushing the reservoir piston all the way to the bottom (inverted - not shown). 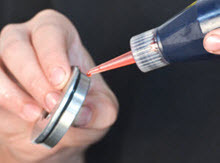 A5 - Apply Loctite to the reservoir cap. 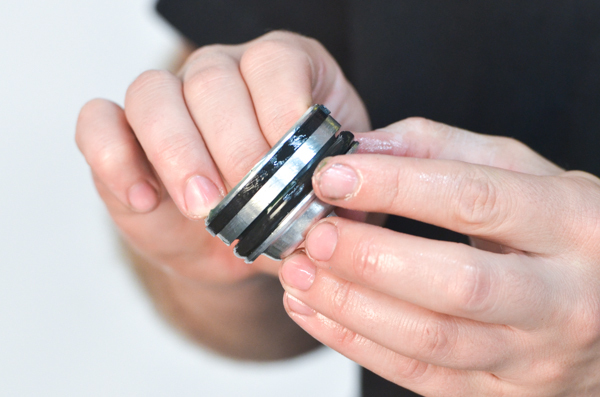 A6 - Lightly grease the O-ring and install the reservor cap. 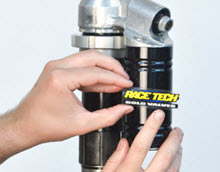 A7 - There are five choices for charging WP shocks. 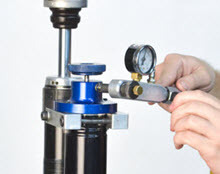 1) Use a SPNV 0512 Nitrogen Charging Bolt and a TSNN 01 Nitrogen Needle. 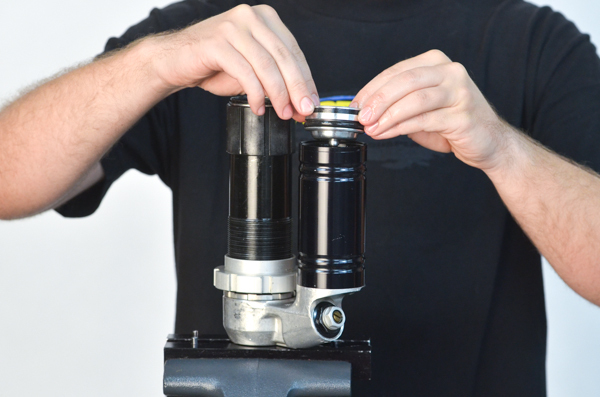 2) Replace the reservoir with a Bladder Conversion Kit (SWBL Series). 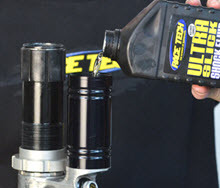 Many riders swear by this mod. 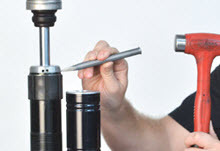 4) Use the official WP charging tool with the stock hardware. 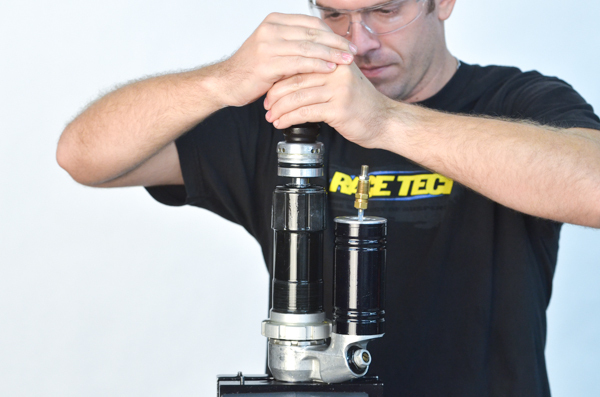 5) Drill and tap the reservoir cap to 1/8" NPT and install a Schrader "Tank" Valve. 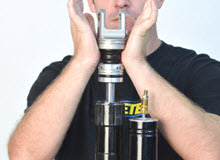 You must be careful as on some models the swingarm will break off the Schrader at full bottom-out. 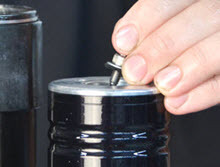 A8 - Insert the nitrogen charging bolt (SPNV 0512) into the reservoir cap. 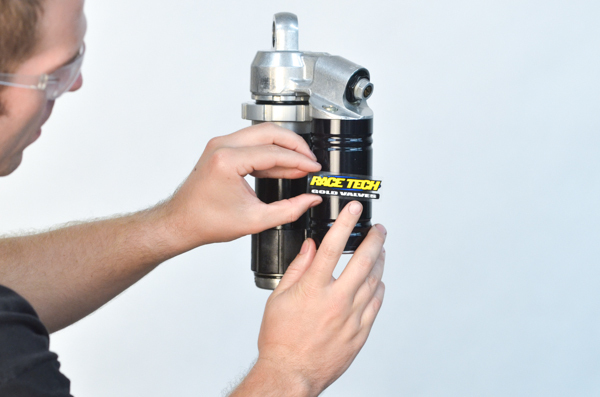 A10 - charge the reservoir to about 20 to 40 psi. 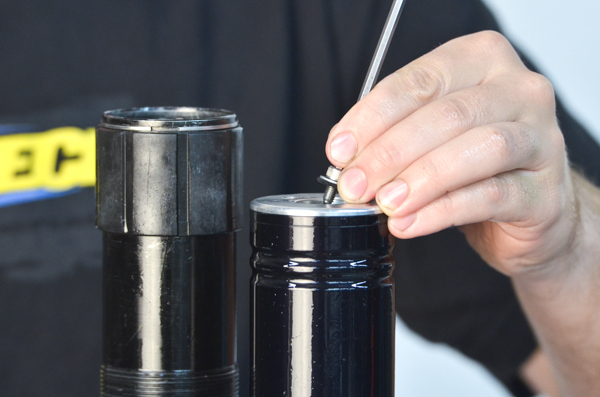 This insures that the piston remains all the way to the end of the reservoir during the bleeding process. 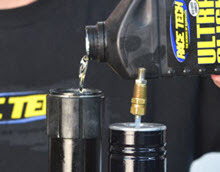 A11 - Add oil in the shock body up to about 50mm from the top. 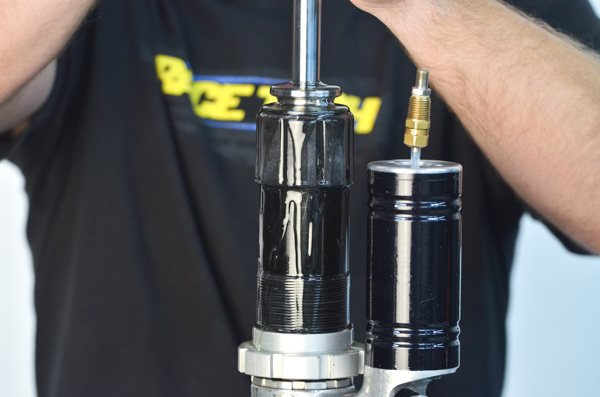 A12 - Install the shaft assembly into the shock body. A13 - The oil will overflow. 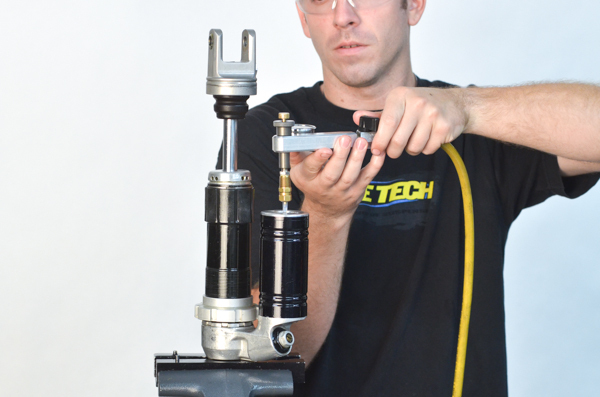 A14 - To bleed the shock rapidly and forcefully compress the shock. 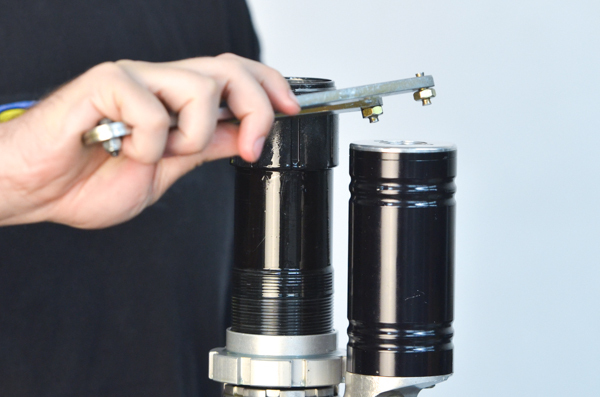 A15 - Extend the shock shaft slowly to avoid cavitation. Repeat as necessary until there are no more bubbles. 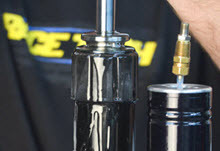 Note - On some shocks it helps to hit the end of the shock shaft with a plastic mallet to force the valve stack open. 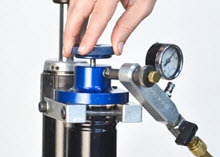 A17 - compress the seal head while releasing nitrogen from the reservoir. A18 - Install the circlip making sure the clip is fully seated in the groove. 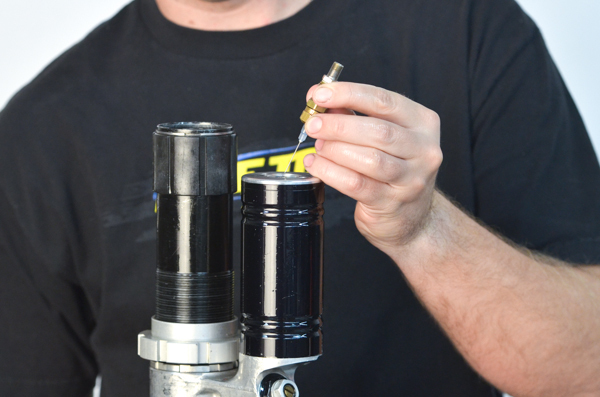 A19 - Pressurize the shock, in this case (with a SPNV 0512), using a TSNN 01 Nitrogen Needle. 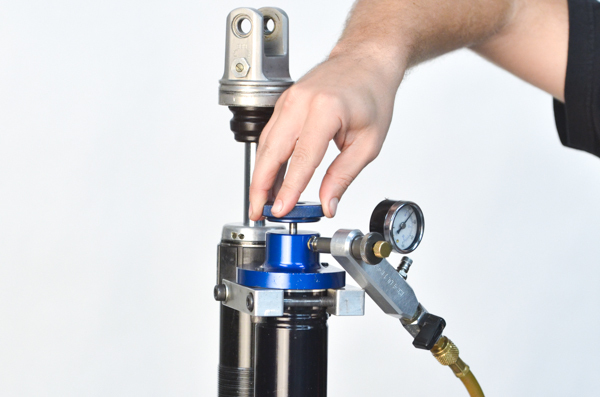 A20 - Another option to pressurize the shock is to use a RT WP Nitrogen Charging Tool (TSNC 02). 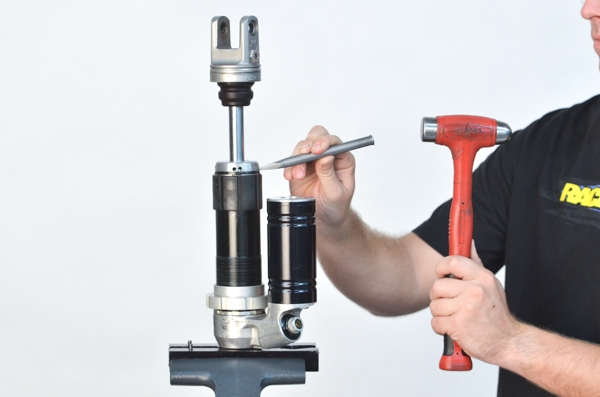 Push down on the tool and tighten the allen clamp bolts. 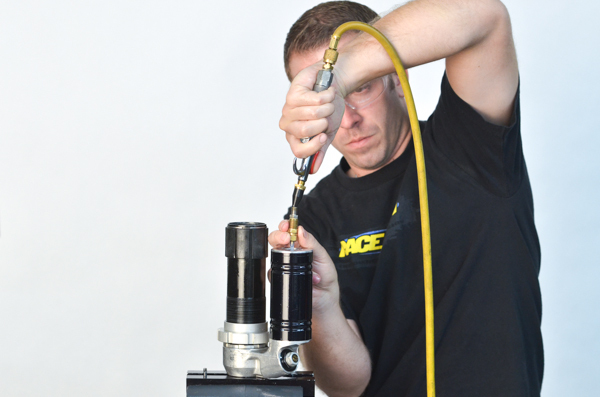 A21 - Charge the reservoir with nitrogen to approximately 175 psi. 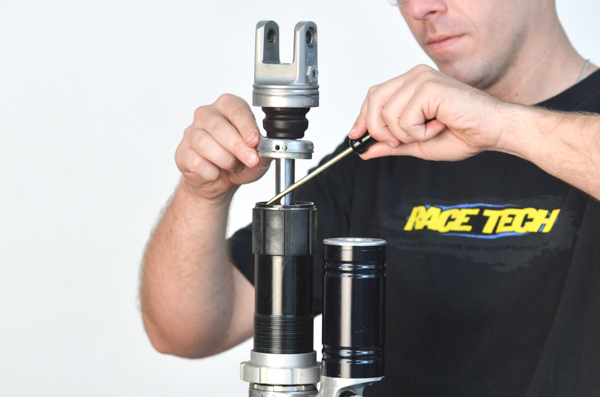 A22 - Tighten down the allen bolt and remove the tool. 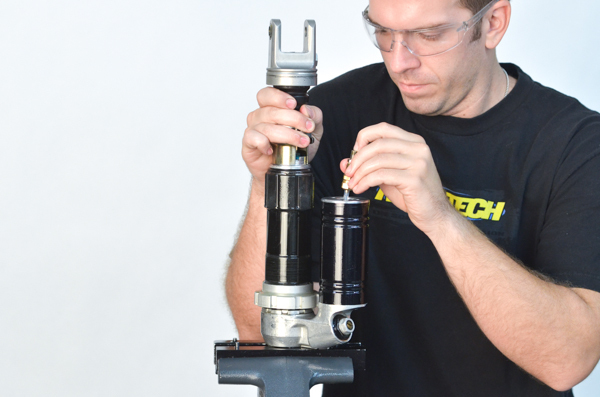 A23 - Compress the shaft and verify that it is charged by watching it return completely. 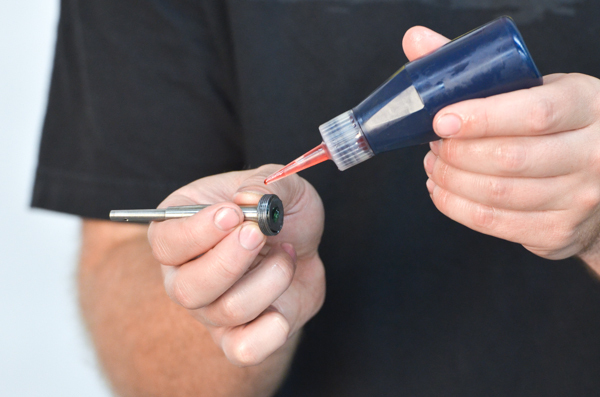 A24 - Install the body cap by lightly, and evenly, tapping it with a plastic mallet. A25 - Install the groovy sticker. Set the clickers, install the spring with the proper preload (see the DVS) and enjoy.